Doris Houston’s new book, Teach The Word ($16.49, paperback, 9781498498821; $8.99, E-book, 9781498498838) gives readers an understanding of the importance of good leadership and the effect that it has on new believers and non-believers. It is sound doctrine based solely on the word of God. It's very informative, and no reader has to search for scripture. Teach The Word is a good teaching tool, and shares the Gospel of Jesus Christ. Houston says, “I want every reader to develop a greater understanding of who God is, get a revelation of His word, operate in the power and authority given to us, walk in the same love that Jesus has towards us and learn to be patient with those that have not yet develop any of these characters and skills”. Doris Houston has learned from well-seasoned men and women of faith both on and off of television. She has been reading and studying God's word for many years. She has served in ministry for 7 years. Houston has studied Christian Counseling at Liberty University, and she believes in asking God for revelation. She tries to never teach on anything except what she believes God has given her. She tries to never to give her opinion, she just wants to say what God says. Xulon Press, a division of Salem Media Group, is the world’s largest Christian self-publisher, with more than 12,000 titles published to date. 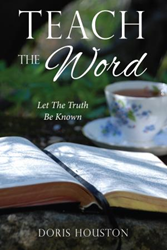 Retailers may order Teach The Word through Ingram Book Company and/or Spring Arbor Book Distributors. The book is available online through xulonpress.com/bookstore, amazon.com, and barnesandnoble.com.